Preheat oven to 400 degrees. Place sweet potatoes on a baking sheet and bake in preheated oven until tender, about 40 minutes. Meanwhile, in a medium saucepan, bring quinoa and broth to a boil, then reduce heat to low and cover and simmer 15 minutes, or until fluffy. Heat oil in a skillet over medium-high heat. Once hot, add onion and saute until tender, about 4 minutes, adding in garlic during last 30 seconds of sautéing. Add onion mixture to cooked quinoa, along with black beans, corn, cumin, paprika, coriander, cayenne, lime juice and honey, 3 Tbsp chopped cilantro and toss mixture. Season with salt and pepper to taste. Cut cooked sweet potatoes in half and scoop out some of the sweet potato flesh to create a bowl shape, while leaving about 1/3 to 1/2-inch of sweet potato intact (reserve scooped out potato in refrigerator for another use). 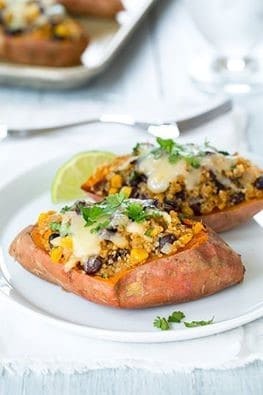 Fill sweet potatoes with quinoa mixture, then sprinkle tops evenly with cheese. Transfer to oven and broil until cheese has melted. Serve warm garnished with cilantro and sour cream if desired. Reblogged this on recipes2live4's Blog. Thank you for reblogging, much appreciated.